Sarma Melngailis sentenced: As the vegan Bernie Sanders once appeared for Vanity Fair…. Sarma Melngailis sentenced: How a vegan restauranteur to the jet set’s double life imploded leading to her being exposed as a scam artist. Proving that the allure of one’s wrongs may often curry benediction from the legal system is former vegan restaurateur to the illustrious and celebrity set, Sarma Melngailis, who on Wednesday was sentenced to a mere 3 and half months for her part in orchestrating a variety of multi-million dollar scams. Appearing at Brooklyn’s Supreme Court, the woman, since affectionately known as the ‘Vegan Bernie Madoff’ had been accused of withholding $40K in wages from 84 employees, stealing $840K from investors along with siphoning a further $1.6 million from her business accounts. As part of a plea deal, Melngailis, 44, only had to admit to ripping off only one investor to the tune of $200K. Along with now only having to serve just 3 months jail time, remain on probation for five years upon her release, Melngailis was also ordered to cough up $1.5million in restitution payments. Yes, I’m waiting for the book deal to make good on that. Courtesy of the lapping tabloids and her revered clientele which included Chelsea Clinton, Alec Baldwin, Woody Harrelson and Kyle MacLachlan, Melngailis was able to parlay her ‘irresistible sheen’ to gullible investors who would soon come to lose more than they’d ever bargained for. With the aid of her now estranged husband, Anthony Strangis, 35, the pair were able to attract investors into their ponzi scheme. Despite their volatile relationship, including a 2010 episode in which Melngailis accused Strangis of disappearing with their then eight month old son, the pair joined forces as they sought to bring on funding for what was meant to be their rising status as celebrity chefs du jour. For reasons not necessarily understood, the couple instead rather than re investing the money back into their business, instead used the funds (Strangis would play the part of a cashed up business man when it came time to suckering investors) to finance an extravagant lifestyle. As well as an insatiable gambling addiction that brought ruin. According to legal papers cited by the nydailynews, along with not paying $400k in taxes, shorting employee wages, the couple spent more than $2million at Foxwoods and Mohegan Sun Casinos. But it didn’t just stop there. The couple also spent another $80K on luxury watches, $70K on extravagant European vacations and another $10K in Uber rides (is that even possible?). With business tanking, investor phone calls unreturned, the couple went on the run come 2014 only to be undone a year later, in May 2015 when a food order of Dominos pizza in Sevierville, Tennessee, led to their arrest. At the time of the couple’s arrest, Melngailis went on to play the damsel in distress card, insisting that her husband had pushed her into a life of illicit behavior along with insisting it was he and not her, the devout vegan who had ordered the pepperoni pizza that led to them being found out…. With Strangis already serving time upon his arrest, and having also agreed to the plea deal, it was now Melngailis’ turn to make the merry trip to Rikers Island where her estranged husband had recently been released from. Of note, had the husband and wife’s case gone to trial, the couple faced the potential of 15 years prison on charges of grand larceny. 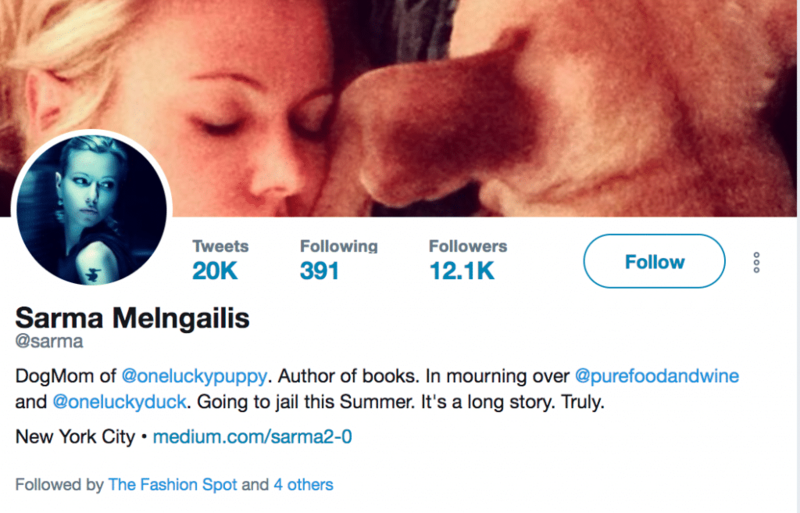 Sarma Melngailis sentenced: Pictured, the former foodie’s twitter account takes stock of her upcoming summer sojourn to jail. Alas.